Nasi Lemak is a Malay word that literally means ‘rice in cream’. Nasi Lemak is derived from the cooking process whereby rice is soaked in coconut cream and then the mixture steamed. Sometimes knotted screwpine (pandan) leaves are thrown into the rice while steaming to give it more fragrance. Spices such as ginger (common in Malay cuisine) and occasionally herbs like lemon grass may be added for additional fragrance. 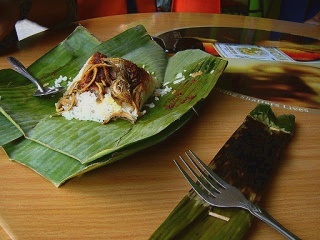 Traditionally, Nasi Lemak comes as a platter of food wrapped in banana leaf, with cucumber slices, small dried anchovies (ikan bilis), roasted peanuts, hard boiled egg, and sambal tumis at its core. 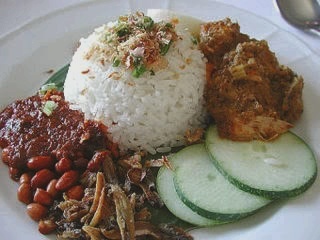 As a more substantial meal, nasi lemak can also come with a variety of other accompaniments such as chicken, sambal sotong, sambal udang, cockle, stir fried water convolvulus (kangkong), pickled vegetables (achar), beef rendang (beef stewed in coconut milk and spices) or paru (beef lungs). Wash rice several time until water runs quite clear. In a pot, add rice, coconut milk, water (please use correct amounts of water according to type of rice). Add shallots, ginger and pandan leaves. Bring to boil, lower heat, simmer 10-12 mins uncovered until the water has been absorbed into the level of the rice. Loosen rice grains with a wooden laddle. Cover with a tight-fitting lid, steam rice on very low heat, about 10-12 mins. When rice is done, gently fluff rice with fork. Blender and mix chili paste, shallots, belacan and garlic into a paste. To a wok or saucepan, add peanut or vegetable oil, heat on high until oil temperature is 350F, fry ikan bilis until crispy. Remove, drain well on paper towels. Remove all but 2 tbsp of oil, saute ground paste for 1-2 mins. Add red onions, tamarind paste, sugar, little salt to taste. Stir sambal and cook until gravy thickens to a dark reddish brown. Add ikan bilis, mix to combine about 5 minutes, remove from heat. Dish a serving portion of coconut rice onto a plate or banana leaf, a little of each garnishing and some sambal ikan bilis – serve Nasi Lemak hot or at room temperature. Tried it today was super wonderful, cravings satisfied for sure! May I know what kind of chilli paste did you use? Can buy rdy? If so, which brand? My friend is in SG now so I can ask her to buy for me. Thank you.